Delicious? Absolutely. Now what about Ethical…? You start your day like any other, cup of coffee in hand. Enjoying the beverage that will fuel the first few hours of your day. Only this morning, you find yourself wondering about the people behind your favourite drink. You are aware there are numerous hard working pickers and producers, but what kind of lives do they live? Is it possible to reduce your ecological footprint in any way? Truth is, the farmworkers behind your daily dose of caffeine are often subject to poor working and housing conditions. Coffee is one of the most wide spread commodities in the world and it has numerous repercussions on the environment. This is the case in many, if not all coffee producing regions of the world. Luckily, a growing interest in Ethically sourced coffees is giving concerned coffee drinkers like you, an opportunity to impact the lives of farm workers and pickers. Although it might not seem tempting to start buying coffee three times the price of what you usually pay for pre-ground coffee at the grocery store with a shelf life of over a year, it presents some advantages. From the quality of the product to the quality of life you can help improve for many within the coffee industry. One of biggest impact is that higher priced coffee offers to the world is it really encourages farmers to produce the best coffee possible. Ultimately this means that farmers are encouraged to grow less coffee of more flavour diverse micro-lots and grow coffee in a more sustainable fashion. This eliminates the need to produce high volumes and reduces the overal impact of the system. One comparison that this relates to for Albertan farmers would be mixed growing agriculture v.s. vast fields of single products. Allows fore less strain on the soil for things like nutrient cycling and longevity and health of the coffee plants themselves. When possible, try purchasing locally roasted beans. That way, you can ask the roaster for more information on the origins of the bean. In doing so, if possible, you will be provided with an overview of the region, the people and seed to cup process unique to each bean. Purchasing Ethically Sourced Coffee will not only help improve the lives of farm workers by providing them with the necessary funds to grow and improve. So what does it all mean to us? We have had the absolute pleasure of sharing our work space with YYC Growers and Distributors for 8 months now. 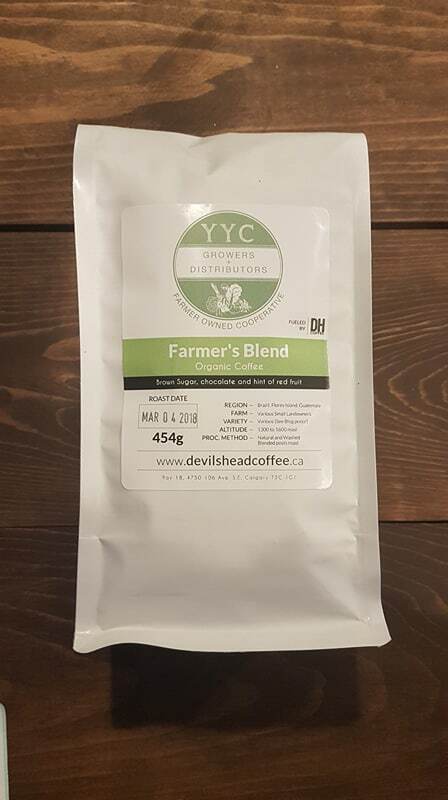 I also grew up in a small farming community in Saskatchewan and supporting a local food system is very near and dear to our hearts at Devil’s Head Coffee. Because we roast and sell whole bean coffee, this is our way of giving back. We are absolutely proud to introduce a custom blend just for YYC Growers and folks who participate in the CSA program. It is called…. Farmer’s Blend. In the following weeks , we will be releasing several blog posts that will take you on the journey of where the coffee comes from, who is involved and what it means as a Calgarian to drink coffee that comes form all over the world!